QC INSPECTED BY LEE ARMORY! 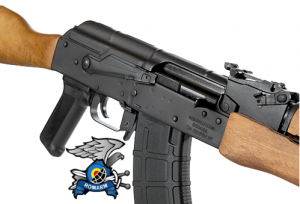 According to Century Arms, an American company which imports and modifies the WASR, they are semi-automatic only, single stack variants generally based on the Romanian Model 63, Pistol Mitralieră model 1963/1965 (PM md. 63), and GP 75 AKM rifles Avtomat Kalashnikova Modernizirovanniy (AKM) series of Kalashnikov rifles originally manufactured in Russia. 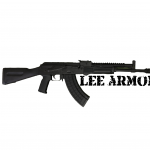 Century decided to import the WASR to meet U.S. demand for AK-style firearms. U.S. federal code 18 USC 922R stipulates that no more than 10 major components of a firearm categorized by federal law as a “semi-automatic assault weapon” could be manufactured outside the U.S. The WASR-series rifles take their name from the 1996 Wassenaar Arrangement, a multilateral export control regime (MECR), the purpose of which is to monitor and limit the proliferation of certain conventional weapons and dual-use technologies. 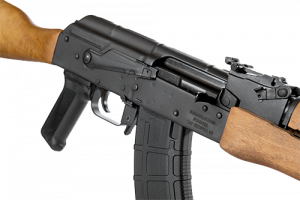 The WASR-series rifles use a Romanian-made receiver, but lack the dimple (used to center the magazine) above the magazine well seen in the other AK series of rifles. Instead WASRs use internally welded spacer plates to center the magazine. The arrangements of the rivets on the receiver and front and rear trunnions are also different from many other AK derivatives. There are no known clones of the WASR series to date. The lack of dimple and rivet layout allows for positive ID in the many different stock configurations. WASR-series rifles are manufactured with stamped sheet metal receivers that were originally intended for single-stack magazines. Featuring hard chrome-lined barrels, side-mount scope rail and wooden stocks, WASR-series rifles are commonly imported to the United States by Century International Arms. 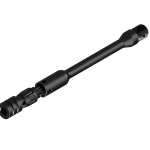 In Romania the rifles are manufactured to conform with certain United States firearms regulations including Title 18, Chapter 44, of the United States Code, which defines laws for manufacturing and importing firearms such as semi-automatic only fire. Century Arms modifies the weapon with upgraded fire control groups (i.e. trigger), pistol grips, and plastic folding or collapsible stocks manufactured by TAPCO of Georgia. Older WASR-series rifles commonly caused trigger slap, which is caused by the bolt slamming backward into the trigger assembly and causing significant pain to the shooter’s trigger finger. 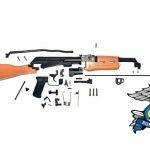 Beginning in 2007, Century International Arms has installed the TAPCO Intrafuse AK G2 trigger group, eliminating the painful trigger slap problem. Rifles with this trigger group will have “TAPCO USA G2” stamped on the left side of the trigger. Some of these rifles may exhibit canted front sight blocks and gas tubes.